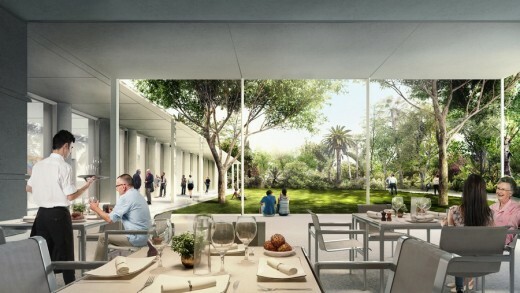 WEST PALM BEACH, FL (Feb. 5, 2016) – The Norton Museum of Art will launch its transformational expansion project, designed by architecture firm Foster + Partners, with a ceremonial groundbreaking on February 6, 2016. The groundbreaking precedes the evening’s annual Gala celebrating the Museum’s 75th anniversary. Pritzker-Prize winning architect Lord Norman Foster, Norton Executive Director Hope Alswang, and Norton Board of Trustees Chairman Harry Howell will be joined by an audience of invited guests for this momentous event, which kicks off construction of the new West Wing. 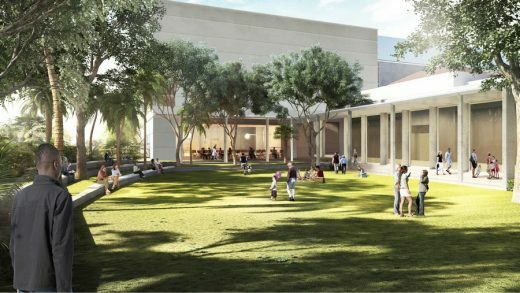 Scheduled to open in 2018, the transformed West Wing includes a monumental entrance, a 35% increase in gallery space to showcase the Museum’s collection and inventive exhibitions, a state-of-the-art 210-seat auditorium, increased education space, and a “great hall” that will become the Museum’s social hub. 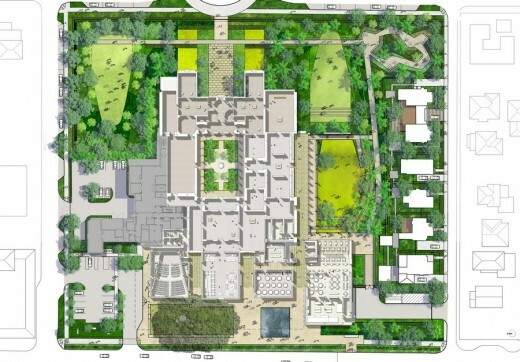 A sculpture garden and additional green spaces will provide new areas for the Norton’s programming, creating a museum in a garden on the 6.3-acre campus. The Museum, which opened in 1941, was initially conceived by architect Marion Sims Wyeth as an elegant series of Art Deco-inspired pavilions organized around a central courtyard. Visitors entered from the east, and from its front door enjoyed a direct view to the Intracoastal Waterway. As the museum outgrew its original footprint, it added new multi-story spaces and moved its main entrance to face south. 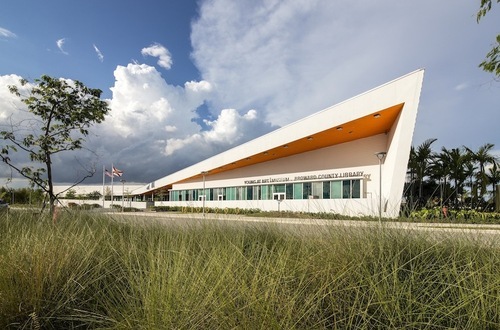 The Foster + Partners plan relocates the entry to the west, giving the Norton a distinctive, welcoming presence on South Dixie Highway while reestablishing the symmetry and clarity of the original Wyeth design. The Heyman Plaza, the new entry forecourt, will feature the serene Michelle and Joseph Jacobs Reflecting Pool and will be sheltered under a monumental, 43-foot-high, semi-reflective metal canopy that “floats” unsupported 45 feet beyond the face of the building. A scalloped-shaped cutout in the canopy respects a majestic 80-year-old, 65-foot-tall banyan tree. 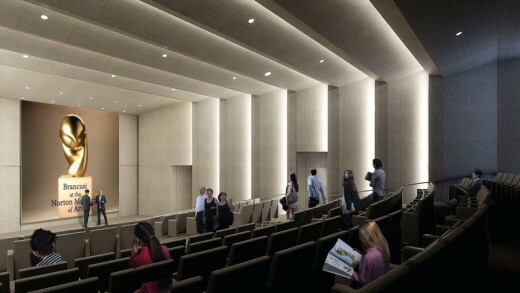 The new event spaces adjacent to the forecourt include the 210-seat state-of-the-art Stiller Family Foundation Auditorium, the Jane and Leonard Korman Special Event Room, and the Leonard and Evelyn Lauder Dining Pavilion, which will offer garden-facing, terrace seating in the John and Marjorie McGraw Garden Terrace. 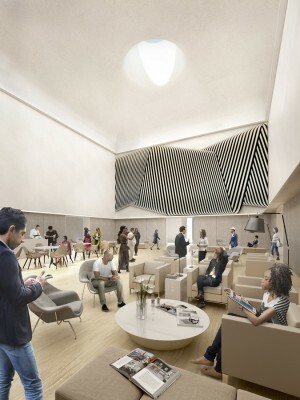 At the center of these spaces is the Ruth and Carl Shapiro Great Hall, a magnificent 3,600 square foot, 43-foot-tall space, which, when not specially configured for events, will serve as the Museum’s living room with lounge seating, a coffee bar, piano, and book carts. Some of the Great Hall’s walls will serve as “canvases” for commissioned, temporary art installations. 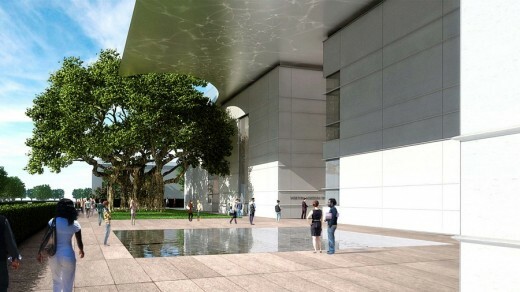 The west-facing wall will feature a 10-x-28-foot-tall window which will admit dappled light, filtered by the leaves and branches of the banyan tree. These distinct spaces can be used independently for a variety of programs, after hours or during regular operating hours. 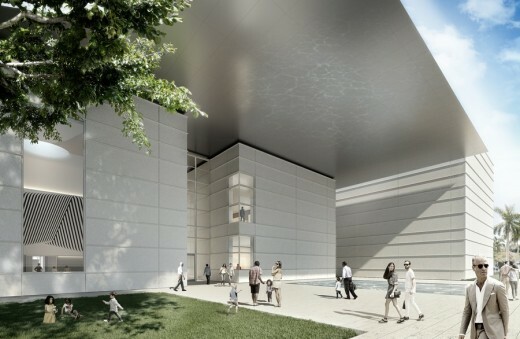 The expansion also includes 12,000 square feet of new gallery space for the Norton’s robust cultural programming, which includes annual exhibitions by groundbreaking women artists and biennial exhibitions by emerging photographers, as well as showcasing the Museum’s distinguished photography holdings and collections of American, Chinese, European and contemporary art. 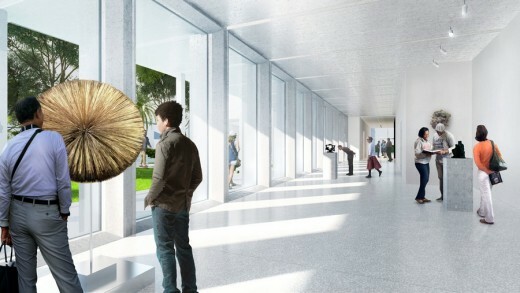 The J. Ira and Nicki Harris Family Gallery will feature a 150-foot-long exhibition space characterized by a colonnade with large windows through which visitors can enjoy garden views. The new William Randolph Hearst Education Center is more than one-and-a-half times the size of the existing education space. It will offer two new classrooms and a student gallery that will allow for expanded workshops and classes for youth, adults, and families. 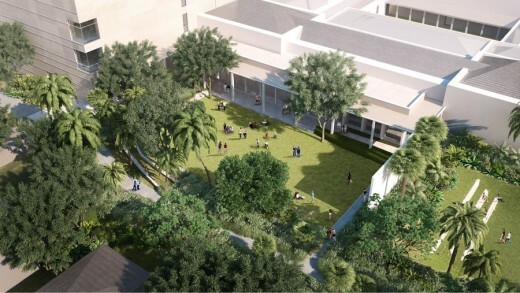 The New Norton is conceived of as “a museum in a garden.” To achieve this vision, 20,000 square feet of lawns and plantings will replace the existing parking lot at the current museum entrance. The gardens are being designed by Kathryn Gustafson of Gustafson Guthrie Nichol and consist of a 9,000-square-foot event lawn, the Pamela and Robert B. Goergen Sculpture Garden, walkways, and a secluded shade garden. The lawn will support formal and informal events with ample room for parties and evening films while all garden spaces are designed to enhance the display of outdoor sculpture. South of the garden, six Museum-owned historic homes are being restored. Two of these have been completed and connected, named Karp House, and now serve as the Director’s Residence. The remaining four will serve as houses and studios for the Museum’s artist-in-residence program. Foster + Partners, one of the world’s most innovative studios for architecture, engineering and design, is led by Founder and Chairman Norman Foster and a Partnership Board. Over the past five decades since its inception in 1967, the practice has pioneered a sustainable approach to architecture and ecology through a strikingly wide range of work, from urban masterplans, public infrastructure, airports, civic and cultural buildings, offices and workplaces to private houses and furniture, working from the scale of an entire city masterplan to a door handle. The studio has established an international reputation with buildings such as the world’s largest airport terminal at Beijing, Swiss Re’s London Headquarters, Hearst Headquarters in New York, Winspear Opera House in Dallas and Boston Museum of Fine Art, Millau Viaduct in France, the German Parliament in the Reichstag, Berlin, The Great Court at London’s British Museum, and Headquarters for HSBC in Hong Kong and London. Founded in 1941, the Norton Museum of Art is recognized for its distinguished holdings in American, European, and Chinese art, and a continually expanding presence for photography and contemporary art. Its masterpieces of 19th century and 20th century European painting and sculpture include works by Brancusi, Gauguin, Matisse, and Picasso, and American works by Stuart Davis, Hopper, O’Keeffe, Pollock, and Sheeler. The Norton presents special exhibitions, lectures, tours, and programs for adults and children throughout the year. In 2011, the Norton launched RAW (Recognition of Art by Women), featuring the work of a living female painter or sculptor and funded by the Leonard and Sophie Davis Fund/MLDauray Arts Initiative. In 2012, the Norton established the biennial, international Rudin Prize for Emerging Photographers in partnership with Beth Rudin DeWoody, named in honor of her late father, Lewis Rudin. The Norton is located at 1451 S. Olive Ave. in West Palm Beach, FL., and is open Tuesday, Wednesday, Friday and Saturday, 10 a.m. to 5 p.m.; Thursday, 10 a.m. to 9 p.m.; and Sunday, 11 a.m. to 5 p.m. (Closed on Mondays and major Holidays). General admission is $12 for adults, $5 for students with a valid ID, and free for Members and children ages 12 and under. Palm Beach County residents receive free admission every Saturday with proof of residency. For additional information, please call (561) 832-5196, or visit www.norton.org.